Action from the game between Werrington Under 13s and Holbeach Reds. Whittlesey Blue are the early leaders in the Peterborough Junior Alliance League Under 13 Division One title race. They made it five wins from five on Sunday with a 9-0 thrashing of Feeder to maintain a two-point lead at the summit over Stamford Young Daniels Red. Ollie Foley was the main goal-grabber with four while Robert Goulding, Owen Hill, William Robinson, Max Jackson and Lewis Johnson all chipped in with one each. Holbeach Reds are also table-toppers with a 100 per cent record. They lead Under 13 Division Two by three points with four wins from four. Werrington Athletic were their latest victims, beaten 6-1 with Ronnie Clayton netting four times. Holbeach also top Under 13 Division Four. There it’s Holbeach Blacks in the driving seat. They were 8-0 winners at Parkside Athletic on Sunday thanks to goals by Mekere Kazombiaze (3), Alan Szablowksi (2), Yasin Nazan, Logan Goddard and Callum Boon. Deeping Rangers Under 14s were big winners in the Lincs Cup. They travelled up to Louth and romped to a 15-0 success with goals from Harry Hewitt (3), Joshua Panks (2), Finlay Adkins-Krijgsman (2), Billy Zyberi (2), William Allan, Joe Barratt, Alex Jungmann, Sebastien Croxall, Samuel Fielding and Daniel Tarver. Feeder got off the mark in fine style in Under 14 Division One. They picked up their first win by beating Glinton and Northborough Amber 6-2 with Riley Taylor hitting a hat-trick. There was better news for Glinton and Northborough in Under 14 Division Two as their Black team won 4-0 against Stanground Sports to go three points clear at the top of the table. Joshua Hill (2), Harry Ward and Kyle Greenwood grabbed their goals. Park Farm Pumas Black are setting a scorching pace in Under 14 Division Three after extending their winning streak to six games with a 6-1 win at Long Sutton. Jowapu Mutendi helped himself to a hat-trick. Deeping Rangers went joint top of Under 12 Division One with Crowland when crushing Colsterworth 10-2. Max Olbromski scored five and Harris Rich hit three. Jack Greenacre came off the bench to fire four goals for Holbeach in a high-scoring Under 15 Division One match against Thurlby Tigers. It was only 2-2 at half-time but Holbeach, inspired by Greenacre’s goals, went on to win 13-4. Other scorers for Holbeach were Elliot Foster (3), Arron Pike (2), Jack Doubleday (2), Daniel Roberts and Kieran Smith while on target for Tigers were Harry Walsh, Ben Griggs and Rhys Holmes. Netherton Hawks were also big winners in the same division. 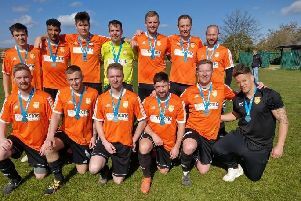 They beat Spalding United Orange 6-1 with Thomas Clarke-Knowles notching a treble. In Under 15 Division Two, March Academy maintained their 100 per cent record with a 4-1 success over Werrington. Daniel Cave scored all four of their goals to take his tally for the season to 15 from five games. Under 18 Division One leaders Bourne Town Blue also made it five wins from five with a 7-0 victory at Chatteris. Ryan Sharp scored four.